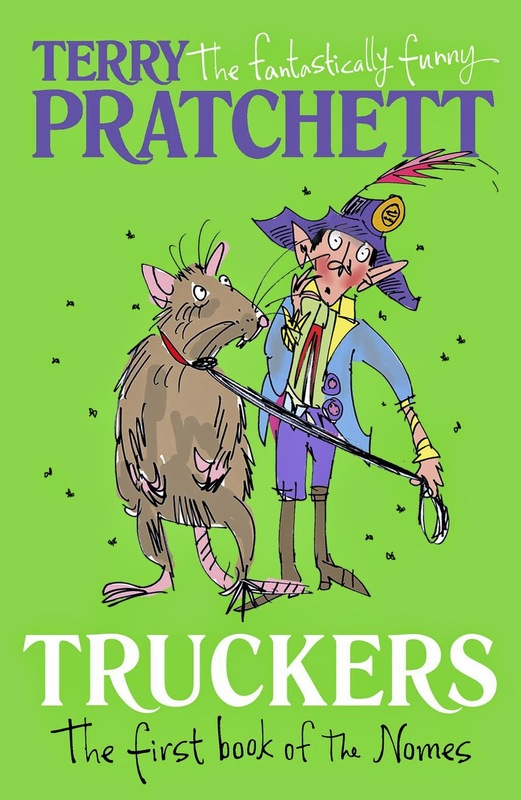 Truckers by Terry Pratchett is the first book in the Bromeliad trilogy aimed at children focusing on nomes. It was first published in 1989 and has recently been repackaged into this brightly coloured edition with lovely cover and accompanying illustrations by Mark Beech. I had a lot of fun with Truckers. I knew very little about the book before I began - only that it is a children's book and that it is not Discworld-related. And this book was a very fun surprise and there was much to find interesting and amusing, especially coming to this book as an adult reader. There is so much humour and thoughtfulness in Terry Pratchett's writing and in his stories. Trucker is the story of nomes, these little creatures only 4 inches tall that live in places that humans do only without the humans knowing. Truckers follows Masklin and his small band of other nomes who have been living Outside and have left to explore, carrying along an important artifact called The Thing. They stumble across this huge colony of nomes living in a department store and at first there are some clashes between the two sets of nomes but they eventually band together after learning that there is very little time before the store closes down for good. I can't say that Truckers has the biggest amount of plot ever. And while there are this core group of nomes that become influential in organising the knowledge and materials required for this mass exodus from the store, they aren't that well-developed, aside from perhaps Masklin. Perhaps that changes throughout the the two other books in the trilogy though? I'm not sure. I mention this, but it also didn't particularly make that much of a difference to my enjoyment of the novel! What it does do though is have is a wonderful mix of humour with very clever and interesting ideas. I'm sure some children might read this story and enjoy it for what it is: a funny, adventurous story of a collection of nomes working together towards a common goal. But there is also this other layer to the story in which Terry Pratchett explores topics such as gender and leadership and belief systems and language in really thoughtful and interesting ways. These subtle explorations of really big ideas is the real draw to this story for me. I've read other books in which Terry Pratchett points out some of the confusing (and therefore hilarious) elements to the English language and in Truckers he again pulls this off beautifully. There was a scene towards the end involving the highway code and road signs that actually made me howl with laughter. And there's also a bit about gender and outdated ideas about women and education and it was lovely to see Grimma's transformation as she begins to read and plays a large part in moving the nomes towards their ultimate goals. Other scenes bring up the importance of faith and also challenging long-held belief systems and there are other characters who champion knowledge and literacy and it all just made me happy. That there is such an intelligent and thought-provoking book. For children. Truckers by Terry Pratchett was a really fun and worthwhile read. It was clever and funny and I do very highly recommend it!